The prayer list | Walk with us! This morning the community rose a half hour early so that we could leave the house at 6:00 am to celebrate Mass for a Monasery of Carmelite nuns. It’s about a 25-minute drive into Eluru from our house. 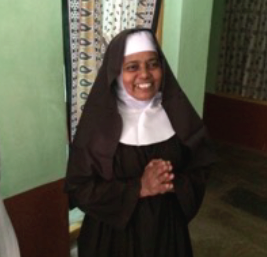 Actually it’s right next door to the convent of Dominican Sisters who accompany our brothers on Sundays to help at Sacred Heart Parish (Vempadu). The monastery has a church attached to it and many people from the local area come for daily Mass. The Dominican Sisters, for example, walk over from their nearby house to attend Mass. The rest of the congregation is made up of local residents and a number of young women beginning their formation as sisters. We had a division of labor for this liturgy. I was the celebrant, Fr. Joseph Gopu, SCJ, gave the introduction and Fr. Mariano, SCJ, the homily. We were also joined by the sister’s chaplain who gave a short talk at the end of Mass not only thanking us for coming but for what our SCJ community does for the church of Eluru. He especially mentioned Fr. Jojoppa, SCJ, pastor of Sacred Heart Parish. The community has a minivan, a 14-year-old jeep, (purchased originally by Br. Leonard Zaworski, SCJ) and two motorbikes. With 17 students and three priests it took all four vehicles to transport us to the monastery. Before we left to head home the sisters asked us to write our names in their prayer intention book and promised to pray for us. When told that the brothers would be going on vacation when school finished in March the mother superior said to them: “Don’t come back unless you have a candidate for our community.” I believe there are between 12 and 14 sisters but they are all up in years and need some young blood. The cloistered life is not an easy one and in today’s world men and women find it less attractive then it once might have been. Still it is a beautiful way life and the Church needs men and women who devote themselves to a life of prayer. I’m happy to know my name is now on their prayer list! At the end of Mass and before we left the chapel the house chaplain exposed the Blessed Sacrament for day-long Eucharistic adoration. One of the prayer tasks the nuns have is to pray in front of the Blessed Sacrament with each sister taking turns; probably an hour at a time.